As famed archaelogist Charles Laurent studies in his London manor, he deciphers an ancient map and learns of the location of an undiscovered tomb. Reading further, he also learns of the tomb guardians: Anubis, God of Death; the immortal Phoenix & the Sphinx Guardian itself. As he descends into the ancient tomb, Charles ponders the legendary curse of the Pharaoh. Who knows what dangers lurk inside..? Can you uncover the Pharaoh's hidden treasures..? Collect keys to open locked doors. 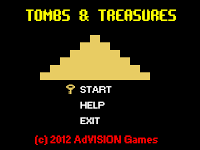 Collect the Ankh symbol to destroy your enemies - use it wisely! Look out for the Eye Of Horus - it will grant you an extra life. Locate the treasure and head for the exit. How many levels can you defeat..? 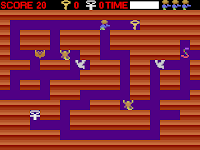 An Atari 2600 styled project inspired by Konami's arcade classic Tutankham. 12 Stages, 3 Boss Fights... and a secret level! Keyboard or joystick controls.